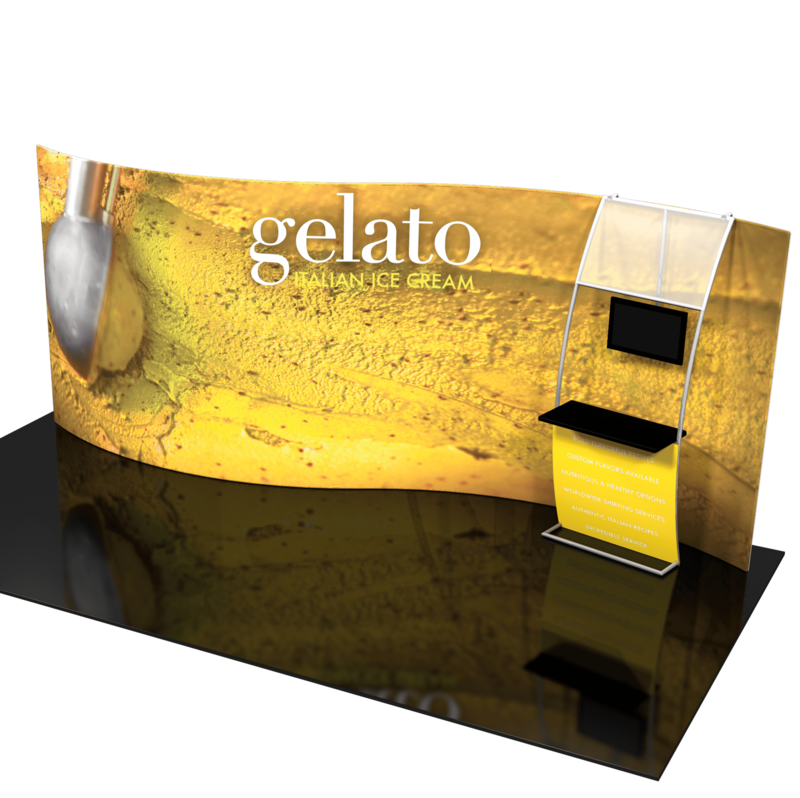 eXpo Branders provides all of the top trends in booth and backwall design. Our goal is to offer a display that is lightweight and easy to assemble, while maintaining a quality that will last for years. 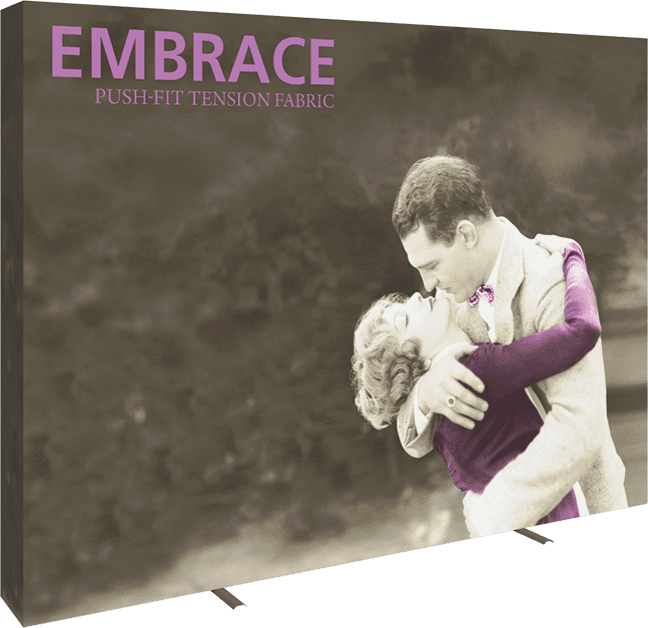 Our clients love our stretch fabric displays because they slip over the hardware like a pillowcase, making them easy to set-up, take down and travel with. Read more about this current technology here. All of our booth and backwall displays can easily be custom made, just pick your wall or booth and add accessories. As with any display, choosing the right one for your event can be daunting. Give us a call and we will walk you through the process. Our 8ft backwalls are a great option for your 8ft-10ft trade show space. Choose from tension fabric, banner walls and SEG push fit walls! The most common size of back wall! Shop our vast collection of 10ft display backwalls to find one that will fit your budget and marketing goals. The step and repeat logo pattern makes for the perfect backdrop at any event. 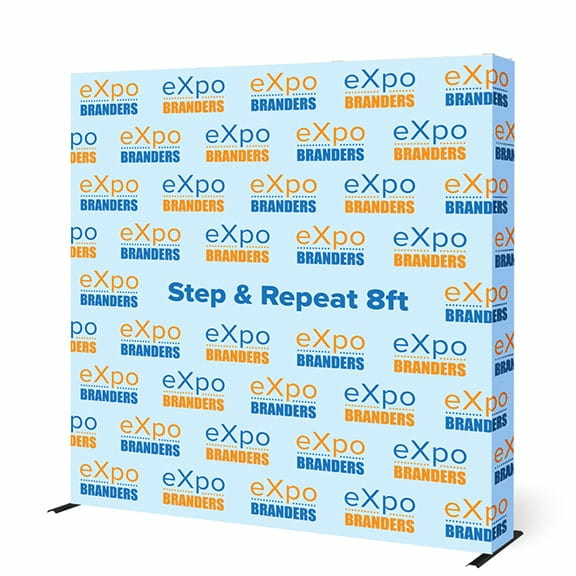 Step & repeat backdrops are available in pole style, tension fabric and SEG push fit. And we can do them FAST! This modular display can be built as wide and high as needed! SEG (Silicone Edge Graphics) A.K.A. Push Fit, are all the rage with their easy to set up, sleek design. Check them all out HERE! 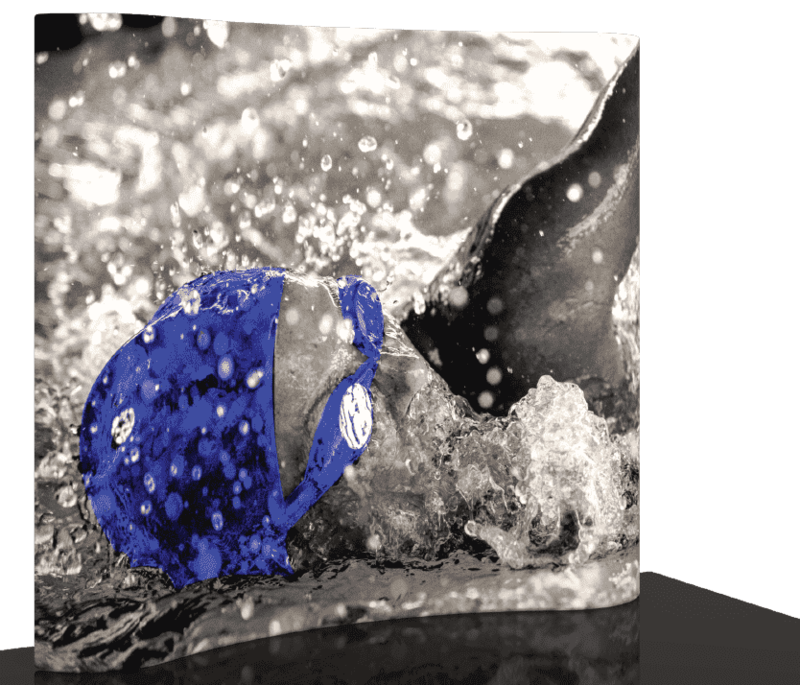 These LED illuminated, push-fit graphic displays will give your display extra edge. Using SEG technology, the slim design will look great in any event space! Our 20ft backwalls come with many design options and accessories to create a beautiful display. 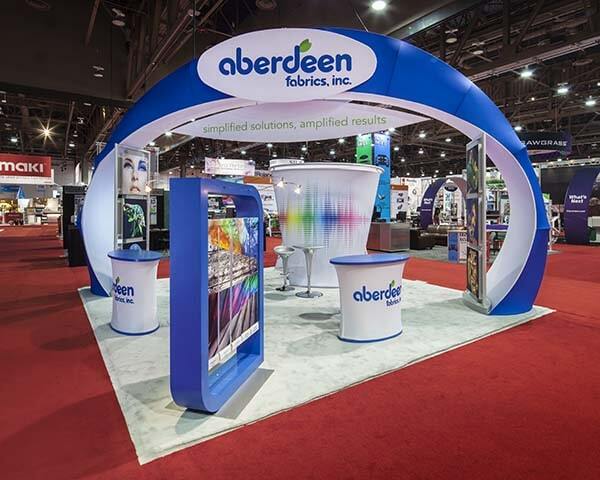 With limitless add ons, we can design the 20' exhibit space of your dreams! Designing your own display is a lot easier than it looks, especially when we can do it for you! Take a look at some displays we have done for other clients and give us a call to start your custom exhibit display project. Whether you are just getting started in exhibiting, or you are a seasoned veteran, buying a trade show display can be a daunting process. Have no fear, our eXpo eXperts are here to help! Where do I start in the process? The first step in choosing a back wall is determining the size of the space you need to fill. 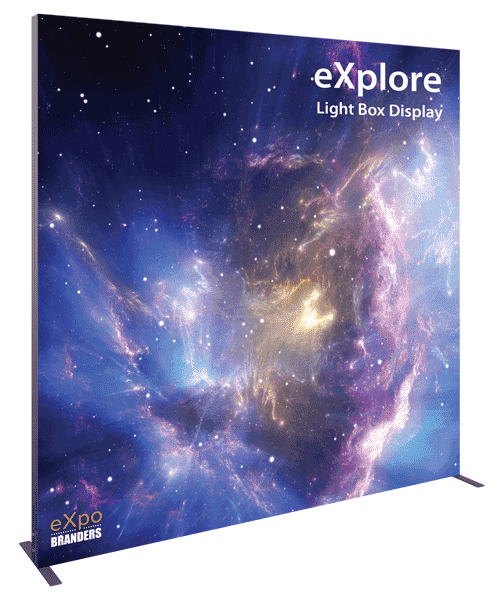 We offer displays to help you shine at table top events as well as 20ft, 30ft, and larger custom displays to fit huge expos. Along with space, you must have a budget! We can best help you choose an event display if we know a window of how much you plan to spend. When will I get my display? 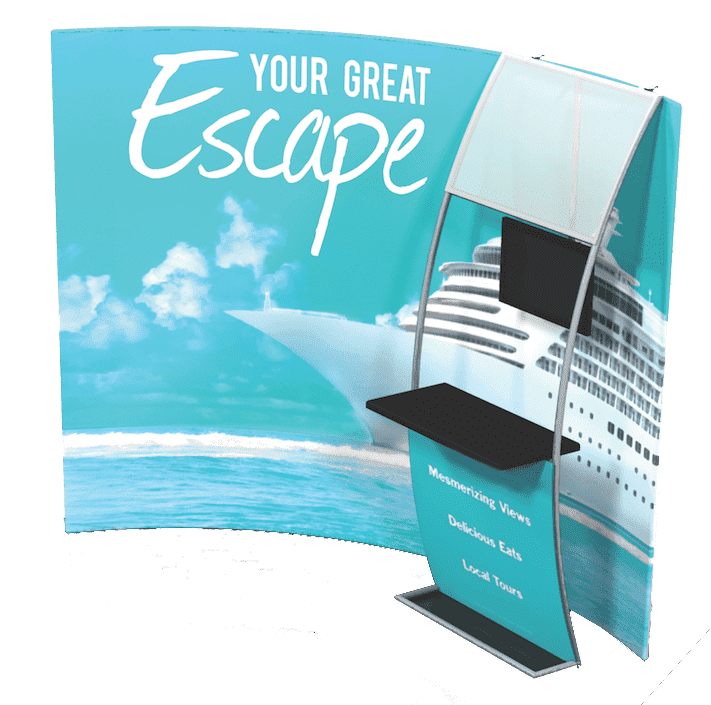 Turnaround time of your trade show display will all depend on the type of back wall or display and whether or not you are in a rush. Typically, our standard turnaround time is 2-10 days, all dependent on the complexity of your specific trade show exhibit project. We work by YOUR in hands date, and, as long as we receive your order and any necessary design elements in a timely manner, we deliver ON TIME, EVERY TIME! My booth is 10' x 10'. What size display will fit? We design all of our 10ft booth displays to fit a 10ft booth. They are all just shy of 10 ft wide, so the easily fit into your reserved exhibit space. It's that simple! How hard is it to set up a back wall display? Can I set it up myself? Most of our featured displays are "roll in" ready, meaning they fit in a portable rolling case and can be put up in a short amount of time by one person. We have videos and supplementing information on all of our displays to assist you in the process. If you get stuck, we are a phone call away and can even video chat to help you solve any assembly issues!